PA police officers trade gunfire with assailants at Fayyad’s compound in Ramallah. No casualties reported. Palestinian Authority police officers traded gunfire with unknown assailants at Prime Minister Salam Fayyad’s compound in Ramallah on Wednesday. 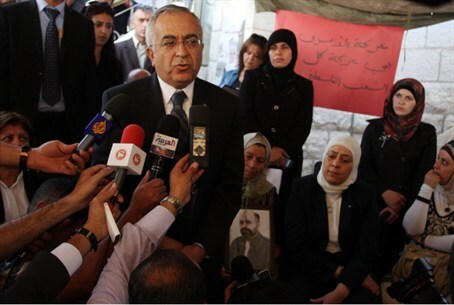 Reuters reported that Fayyad was not at the compound at the time. PA officials declined to comment, citing the sensitivity of the incident. There was no immediate indication of who was behind the attack. Reuters reported that the exchange of gunfire lasted around a minute. The PA-based WAFA news agency reported that there had been no casualties. The shooting occurred on a main thoroughfare clustered with modern government buildings under constant police guard, the report said. In July, PA Chairman Mahmoud Abbas launched his broadest weapons crackdown in years, marking the first time he has confronted his own loyalists, including rogue security officers and gunmen linked to his Fatah movement. The arrest raids conducted in recent weeks are a response to high-profile vigilante shootings that threatened to undermine law-and-order successes in Jenin. Fayyad recently told Reuters that the operation would be broad-based and long lasting. A previous crackdown in Jenin was launched in early May, soon after the death of the local governor. One of those arrested in May was Zakaria Zubeidi, the former commander of the Fatah movement’s al-Aqsa Martyrs Brigades in Jenin. The reason for the arrest is unclear but may have been part of the same crackdown.